PERMARK INDUSTRIES – 50 YEARS AND GOING STRONG! Permark celebrated a momentous milestone in 2017 – our 50-year anniversary! Since Owen Higgins started printing plastic labels and engraving aluminium nameplates in a small factory in Marua Road, Auckland in 1967, we’ve become a leading speciality custom-design printing services company across Australasia. We expanded over the decades by creating wise mergers, investing in the latest technologies, and capitalising on our design flair and innovative thinking. We now have offices in Auckland, Sydney and Melbourne, operate factories in Auckland and Christchurch, employ 75 people and are recognised by returning customers around the globe and major trade associations for our outstanding design and technical skills. For example, we are ISO9001:2015 Telarc registered and manufacture quality critical products in a ‘clean room’ environment. Indeed, our attention to quality has resulted in over 30 Gold and more than 40 Highly Commended print awards in industry competitions. Our products range from membrane keypads with printed silver and carbon circuits for complex control panels, through to metal name plates for farm machinery. Our products are unfailingly accurate, safe, durable and easy to use. 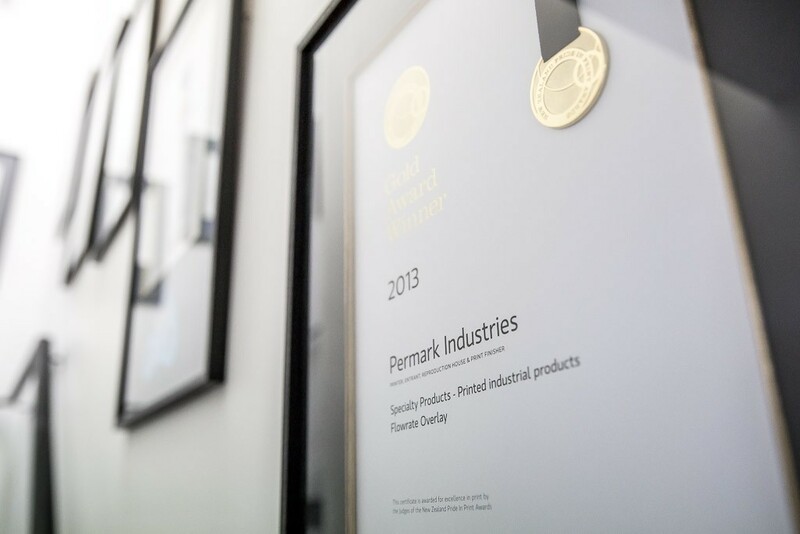 Permark has a proud history of helping industry worldwide design their products to perform in all kinds of difficult environments, meeting both current needs and anticipating future trends. As well as our loyal customers and hand-picked suppliers, we also owe Permark’s ongoing growth and success to our fantastic employees – who include some of the most dedicated and highly skilled printers and operators in New Zealand. We take immense pride in developing our people and passing on highly developed skills to the next generation. We know that means our business stays robust, and we’re creating strong and sustainable career opportunities for our employees. Since acquiring Electronic Imaging Ltd in 2011, we’ve continued to make substantial investments in digital equipment and we have so much more planned. Watch out as we push on through our next 50 years – it’s going to be amazing! 1967 – Permark Industries starts printing and engraving in Ellerslie, Auckland. 1986 – Permark Industries merges with Auckland based Pen Industries. The business transitions into UV printing of polycarbonates. The product portfolio is extended to include control panels, membrane keypads, domed resin labels and self-adhesives labels. Early1990s – first Australian sales, which leads to opening an office in Sydney and Melbourne. 1997 – the business relocates to a custom-designed factory in Felton Matthew Ave, Glen Innes, Auckland. Investment in new European button embossing, laser engraving/cutting, and resin machines follows closely after. 1999 – David Jack purchases Permark Industries. Early 2000s – Photochem and Decal Nameplates acquired, extending the metal processing to include stainless steel etching. This capability facilitates the supply of plates to the New Zealand dairy and Australian pump industries. Soon after, the first Roland digital reel printer and Digital flatbed printer are purchased. 2011 – Permark purchases Christchurch-based Electronic Imaging Ltd (formerly Markit Graphics). Lloyd Mearns (MD of EIL since 2009) along with a small associated shareholder group become shareholders in Permark Industries. 2014 – Lloyd Mearns takes over from David Jack as MD of Permark Industries and EIL in a planned succession move. David Jack remains as a director and shareholder.